Fault blocks are very large blocks of rock, sometimes hundreds of kilometers in extent, created by tectonic and localized stresses in the Earth's crust. Large areas of bedrock are broken up into blocks by faults. Blocks are characterized by relatively uniform lithology. The largest of these fault blocks are called crustal blocks. While the large crustal blocks broken off from tectonic plates are called terranes. Those terranes which are the full thickness of the lithosphere are called microplates. Continent-sized blocks are called variously microcontinents, continental ribbons, H-blocks, extensional allochthons and outer highs. 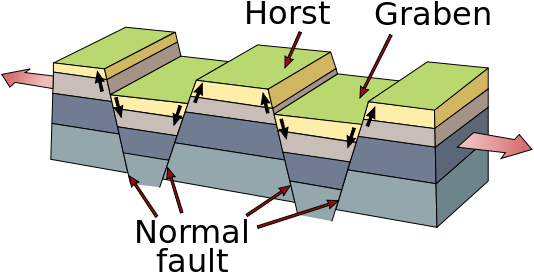 Because most stresses relate to the tectonic activity of moving plates, most motion between blocks is horizontal, that is parallel to the Earth's crust bystrike-slip faults. However vertical movement of blocks produces much more dramatic results. Landforms (mountains, hills, ridges, lakes, valleys, etc.) are sometimes formed when the faults have a large vertical displacement. Adjacent raised blocks (horsts) and down-dropped blocks (grabens) can form high escarpments. Often the movement of these blocks is accompanied by tilting, due to compaction or stretching of the crust at that point.